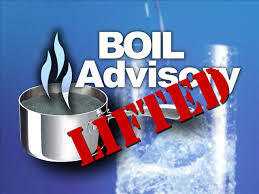 COPPERHILL, Tenn. – A recent boil advisory from the city of Copperhill to its water customers has been lifted after tests confirmed the city system’s water is safe for consumption, according to Copperhill City Recorder Suzanne Hughes. Hughes confirmed Friday, Dec. 29, water is pumping normally from the McCaysville water treatment plant, which supplies water for both cities, into the Copperhill system. For McCaysville water customers, however, a water conservation advisory remains in effect as filters at the city’s water treatment plant continue to be replaced, Nancy Godfrey, McCaysville city clerk, stated. According to Godfrey, the filter replacement at the McCaysville water plant stem from issues that took place at the plant in early October when heavy rains and a seasonal water turnover at Lake Blue Ridge forced an unusual amount of silt and sediment into the Toccoa River, causing filters to fail. Though work at the plant is expected to continue at the McCaysville water plant into the new year, no specific completion date for the filter replacement could be given from the city of McCaysville at this time. COPPERHILL, Tenn. – History is synonymous with life here in southern Appalachia, and perhaps nowhere is history more apparent in our area than in the Copper Basin region of north Georgia and east Tennessee. 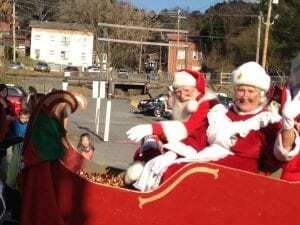 A large part of that deep-rooted history continued Saturday afternoon, Dec. 2, on the streets of McCaysville, Georgia, and Copperhill, Tennessee, as the 59th annual Christmas Parade delighted hundreds of festive onlookers lining the streets and bridges of the twin cities. Each year, the Kiwanis Club of Copperhill sponsors the parade, and as Howard Jabaley, the local Kiwanis chapter president, explained, this is a tradition that goes back a very long time. Though there has been a break or two through the years, one being during the early 1940s while WWII was taking place, the parade, and the Kiwanis Club’s participation, traces its roots all the way back to 1923, according to Jabaley. Copperhill, Ducktown and McCaysville mayors Kathy Stewart, Doug Collins and Thomas Seabolt, respectively, greeted parade goers. 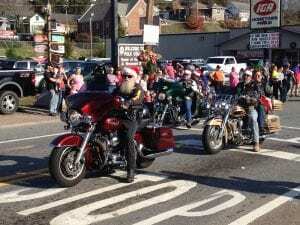 This year, McCaysville Police Chief Michael Earley kicked the event off by leading the way down West Tennessee Avenue, Blue Ridge Drive and eventually making the turn down Ocoee Street and into the Volunteer State. Close behind in a shiny silver convertible were McCaysville Mayor Thomas Seabolt, Copperhill Mayor Kathy Stewart and Ducktown Mayor Doug Collins tossing handfuls of candy to excited young parade goers. According to Collins, years ago, the parade would make its rounds in the twin cities and then pack up and head north three miles on Hwy. 68 to downtown Ducktown to give the residents there an annual Holiday display. 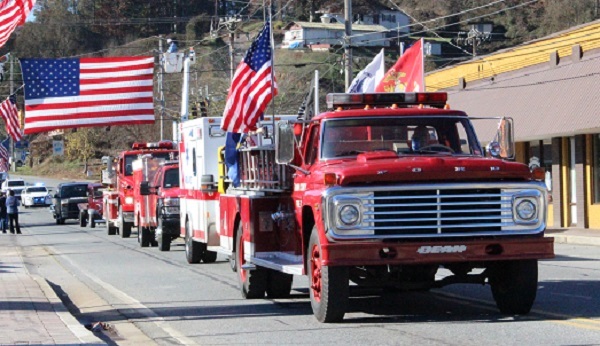 For those kids, the usual display of fire engines and emergency vehicles from the Copperhill Volunteer Fire Department, East Polk Fire and Rescue and the Fannin County Fire department passed the masses on sidewalks with glowing red lights and blaring sirens. 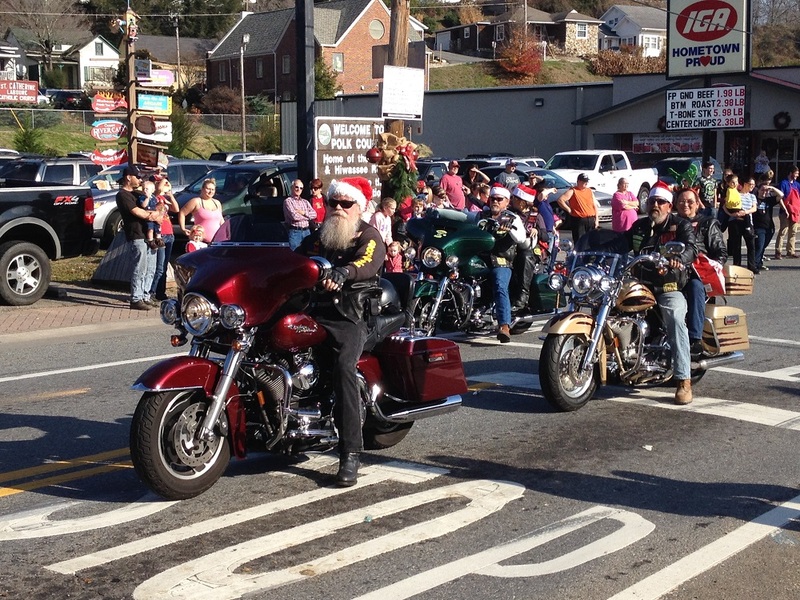 Of course, no parade would be complete without a pack of thunderous motorcycles rumbling through the streets and shaking storefront windows, their riders all donning Santa hats. A large group of motorcycle riders revved their engines loudly to the delight of onlookers. Boy Scouts Troop 32, of Epworth, and 14, of Ducktown, marched down the route proudly carrying flags and banners. 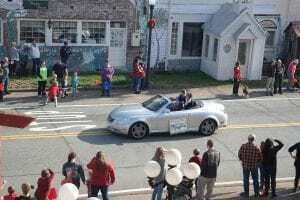 Two high schools, Fannin County High and Copper Basin High, participated again in this year’s festivities, offering up Holiday tunes played by their respective bands and escorting their 2017 homecoming queens in snazzy-looking convertibles. Several elaborate floats from churches and various organizations and businesses glided down the twin cities’ streets with joyful youngsters atop singing traditional Holiday carols. Vintage cars, trucks, tractors and even dune buggies added to the down-home display. Following at a safe distance away from the hustle and bustle of the parade lead were the Back Country Horsemen of North Georgia with an impressive display of thoroughbreds. All the way from the North Pole, Santa and Mrs. Claus made a special appearance Saturday at the 59th annual Kiwanis Copperhill/McCaysville Christmas Parade. 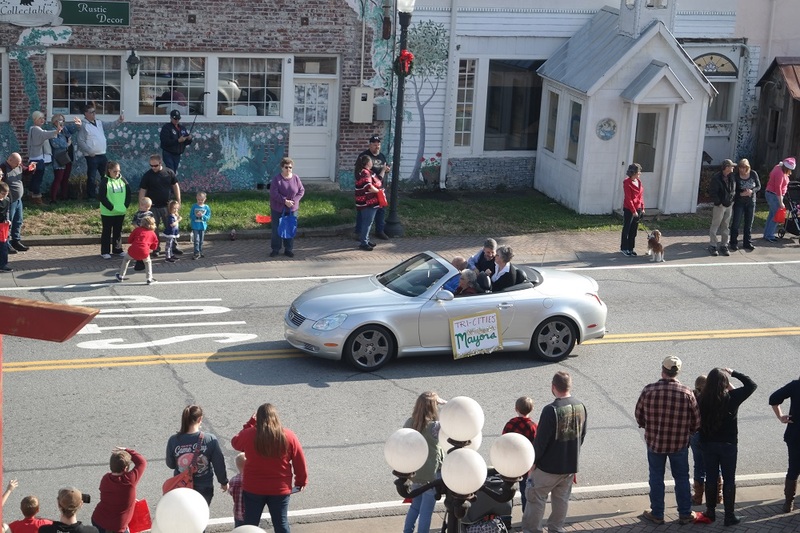 As the friendly faces of so many familiar folks passed, both in the parade and on the sidewalks, through downtown McCaysville and Copperhill on a sunny December afternoon, it was easy to see why this wonderful tradition has stood the test of time for so long. And it is safe to say that the sense of community of these two mountain towns will keep this great tradition of history alive for generations to come. 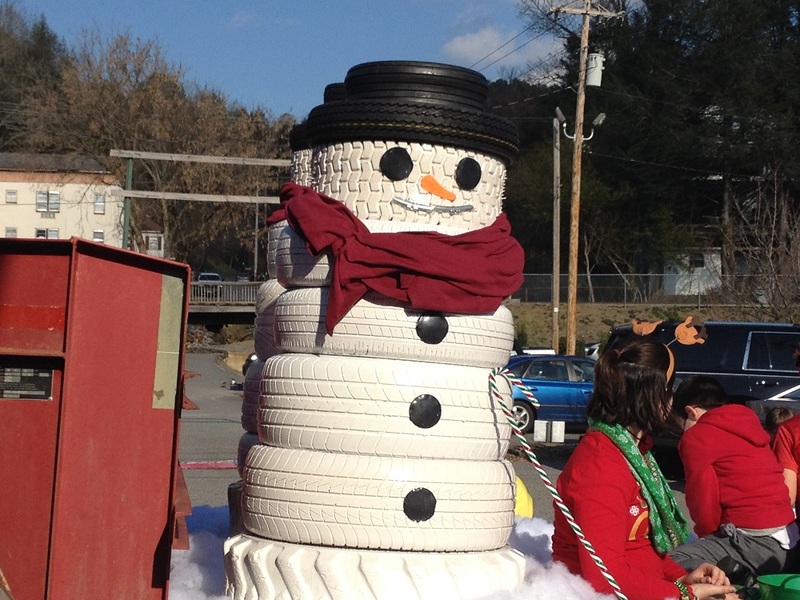 Featured image: Nicholson Tire provided an interesting-looking snowman on their float that the Michelin Man would be proud of. 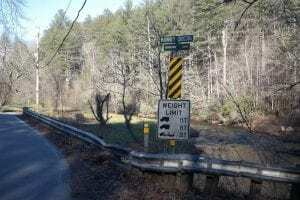 The Madola Road bridge over Fightingtown Creek recently experienced a reduction in load capacity limits. 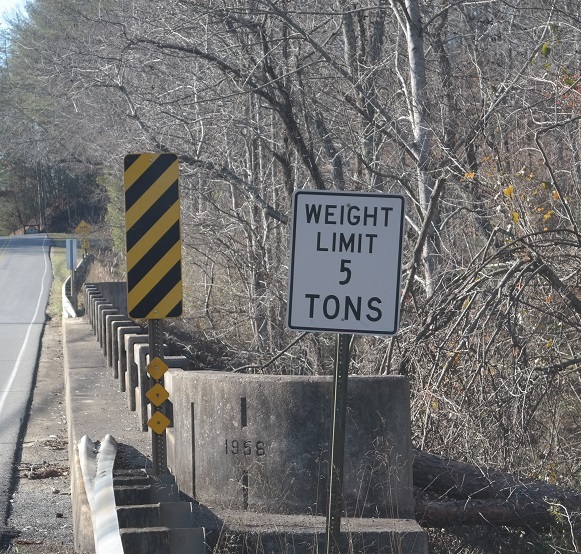 EPWORTH, Ga. – Fannin County Director of Public Works Zack Ratcliff announced Thursday that the weight load capacity for the Madola Road (county road 159) bridge over Fightingtown Creek has been reduced from a 10-ton limit to a five-ton limit. 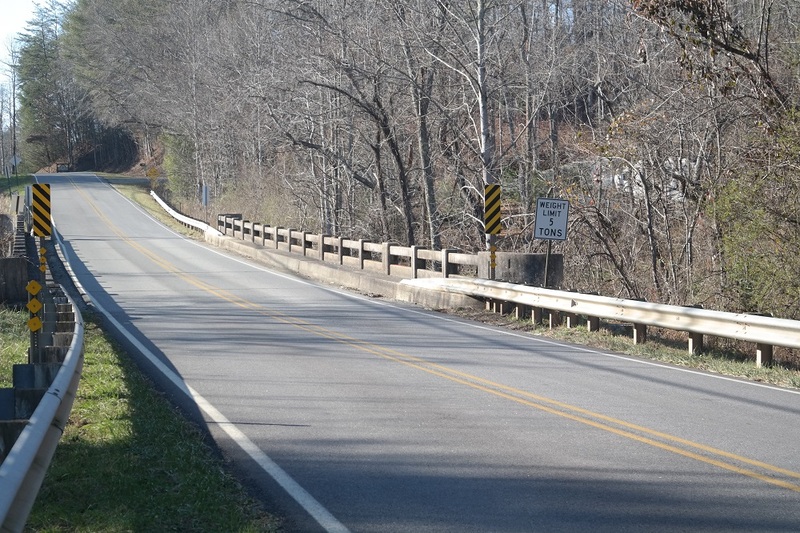 According to Ratcliff, the changes came after the Georgia Department of Transportation (GDOT) completed a recent inspection of the bridge located near Epworth in early December and found deficiencies in it, leading to the state-mandated change in load capacity. 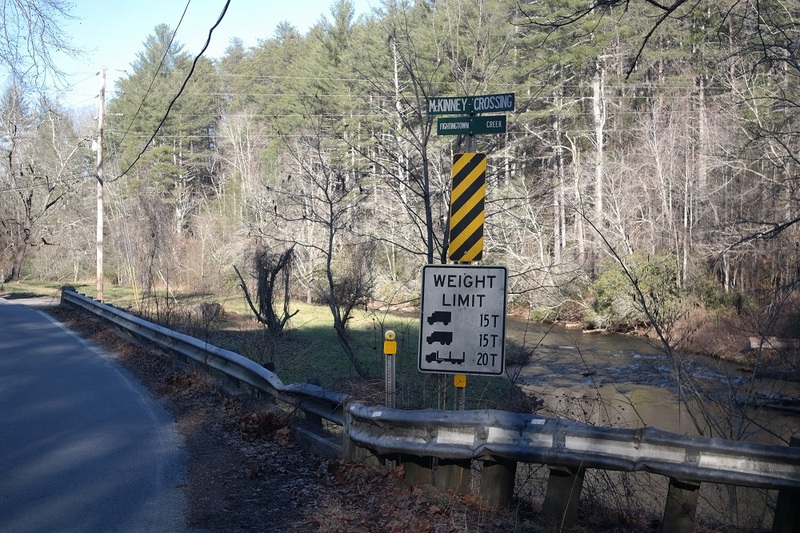 Ratcliff added that signs informing drivers of the new capacity have already been posted at the bridge and the public works department also plans to post signs in the near future at either end of Madola Road telling motorists off the change. Ratcliff asks all applicable drivers to abide by the new limits to the bridge, which was built in 1956. At present, no short and convenient detour route is available for drivers of vehicles that exceed the limit. However, detours are available by way of Mobile Road through Copperhill, Tennessee, and McCaysville or via Mobile Road to Colwell Road to old state Route 2. Both Mobile, which eventually becomes West Tennessee Avenue in the twin cities, and old state Route 2 cross Fightingtown Creek and connect with state Route 5. 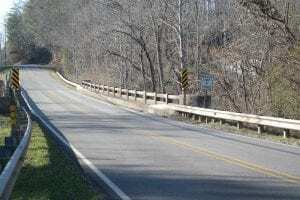 The old state Route 2 bridge at McKinney Crossing is an option for vehicles over five tons unable to travel Madola Road. While Ratcliff conceded the new change creates an inconvenience for some drivers, the state mandate required the county public works department to comply with the GDOT’s determination for the bridge by changing the load capacity or possibly face a withdrawal of federal funding. 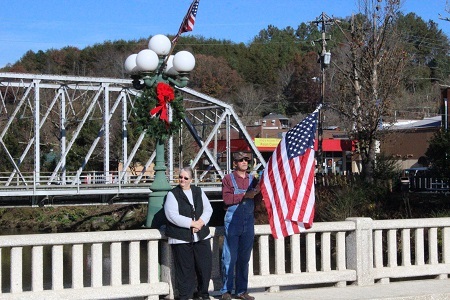 McCAYSVILLE, Ga. – Under a massive American Flag provided by Tri-State EMC and amidst strains of patriotic tunes sung by local musician Hank Brake, a large procession rolled down the streets of the twin cities of McCaysville, Georgia, and Copperhill, Tennessee, Friday, Nov. 10, in observance of Veterans Day. 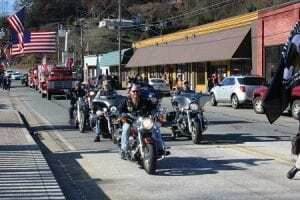 Motorcyclists rumbled through the streets of McCaysville, Georgia, and Copperhill, Tennessee, during Friday’s Veterans Day parade. The parade, featuring a mix of flag-adorned military Humvees, Fannin County and Polk County, Tennessee, emergency vehicles, rumbling Harley Davidson motorcycles and antique cars and trucks, brought several patriots out on a brisk fall morning to support veterans, our military and the good old USA. 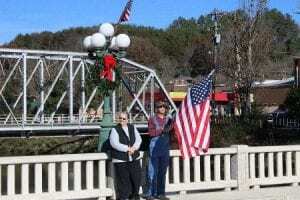 Perched on the William T. “Boss” Mull Memorial Bridge overlooking the Toccoa River, one couple, Bob and Sheila Loudermilk, brought Old Glory with them in a show of support. Shelia and Bob Loudermilk, of Blue Ridge, showed their support of the American Flag during the Veterans Day parade in McCaysville and Copperhill. Veterans Day was originally established as Armistice Day in commemoration of the armistice signed at Compiègne, France, between the Allies and Germany, which effectively ended hostilities on the Western Front in World War I. The armistice was signed at “the eleventh hour of the eleventh day of the eleventh month” in 1918. In 1954, the United States renamed the holiday Veterans Day to honor those who served in the United States Armed Forces. The parade, co-sponsored by the McCaysville Police Department and the Tri-Cities Business Association, was followed by the third annual McCaysville Police Shop with a Hero BBQ.